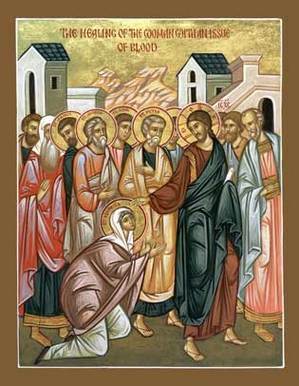 The collect and readings for the Fifth Sunday after Pentecost, Proper 8, may be found here. The following sermon is based on the gospel, Mark 5:21-43. Do you ever feel like the bucket of your life has a hole in it? That it leaks faster than you can fill it? No matter what you do, how hard you work, where you go, what you try, you just can’t fill it up. Work, play, friends, and family all leave you feeling empty, restless, and searching. You can’t seem to get enough. The outflow is greater than the inflow. You are left drained of life: tired and weak, frustrated and hopeless, angry and resentful, sorrowful and grieving, fearful that you will never have the life you want. 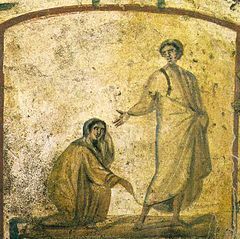 If you know what that is like, perhaps you know the hemorrhaging woman in today’s gospel. We don’t know her name. We don’t know where she came from. She could be any one of us. She’s anonymous; another face in the crowd. What we do know is that she is sick, desperate, and in need. She has been bleeding for 12 years. That’s 4,380 days. In all that time no one has been able to help her. She’s spent all she had: time, money, energy. She’s only gotten worse. Day after day, week after week, month after month, year after year it’s always the same. Blood. She’s a walking fountain of blood. The woman’s condition is more than physical. She’s losing more than blood. She’s losing her life, its warmth, vitality, and fruitfulness. That is a spiritual matter. Life and death always are. At one level this is a story of an individual woman. At another level it is the human story. Her story is our story. It is as much about men as it is woman. Drained of life, we go through the motions. We’re alive but not really living. We feel disconnected, isolated, and alone. I suspect the bleeding women spent many of the last 4,380 days thinking, “As soon as.…” Today, however, is different. Something in her has changed, shifted. She has heard about Jesus. Maybe she heard about his teaching, about him casting out demons, about him healing the sick, or about him calming the storm on the sea. We don’t know what she heard about Jesus but it was enough to make her believe she is more than a bleeding woman. She would no longer wait on others to fix her life. She refused to be identified with the circumstances of her life. Today she would reach beyond those circumstances and literally take matters into her own hand. Deep within she knows, “If I but touch his clothes, I will be made well.” No matter how much we bleed, the truth of those words flows through our veins. She knows that Jesus offers a life that is “unleakable,” a life that can never be drained from her. She touched his cloak. In that moment she was transfused with and by the power of God. It was enough to touch. The connection was made and a relationship established. Life no longer leaked out of her but flowed into her. The hemorrhage stopped but the healing continued. “Who touched my clothes?” Jesus asked. He was calling her out. He would not allow her to remain a nameless face in the crowd. He would not allow her to drift off into anonymity. He named her, “Daughter,” and sent her on the path of peace. She would no longer be the bleeding woman. She is now a daughter. She has an identity, a place, and a relationship. She has been healed and made whole. She is now fully alive and free to go in peace. That is the “unleakable” life Jesus offers each of us. We no longer have to live drained of life. We too can know ourselves to be called, “Son” or “Daughter.” We too can walk the path of peace fully alive. If we but touch his clothes we too will be healed. Every moment holds before us the opportunity to touch. That means we must reach beyond the circumstances of our lives. We can no longer live “as soon as” lives. It means we must take matters into our own hands. I’m not suggesting that we are in control but that we have a choice and a responsibility. Our faith must be active and tangible. How do we do that? We begin by looking at the clothes Jesus wears. Sometime he drapes himself in silence, solitude, and prayer. Sometimes it’s mercy and forgiveness. Sometimes it’s thanksgiving and gratitude. Other times it’s compassion and generosity. Always it is self-giving love. The very attributes and characteristics of his life are the clothes he wears and the clothes we are to touch. Wherever you are living drained of life, touch the clothes of Christ. Connect to them in your own life. Let them transfuse you with his life, his love, and his power. Touch and be healed. Touch and be named. Touch and go in peace. Mike this is a great sermon. This is another example of the clear, easy to understand Christian art/work you provide our congregation. It sheds new light and helps us enforce our faith. This touched me on so many levels today. A very timely and important message! Thank you so much! Jan, I am glad the sermon was helpful. Thank you. Wow! Thank you, again, Michael! You are most welcome. I hope you all are well in Colorado. Absolutely fabulous. Am reblogging this to show my appreciation. I love your term “unleakable” lives. Inspirational. Have also forwarded to a Christian minister friend. Stephanie, thanks so much for your appreciation of and reblogging my sermon. I am glad you liked it. I think we are always searching for the “unleakable” life. Beautiful post by Michael here. I love his term “unleakable lives”. What A Spiritual Insight! I really need to touch Jesus’ clothes of teaching (words) with my eyes of faith. Thank you. You just spoke to my life. I thank God for directing me to your site….. No more leakages. I’m Mpumi from South Africa. God keep on blessing you. Mpumi,thanks be to God there are “no more leakages.” May God’s helming presence continue to fill and sustain your life.